Ilyushin Il-114 short-haul planes will be produced in Nizhny Novgorod, Russian Deputy Prime Minister Dmitry Rogozin said on Nov. 9. "Orders have been given to develop a short-haul plane on the basis of the Il-114. Production will be launched in Nizhny Novgorod, " Rogozin tweeted. 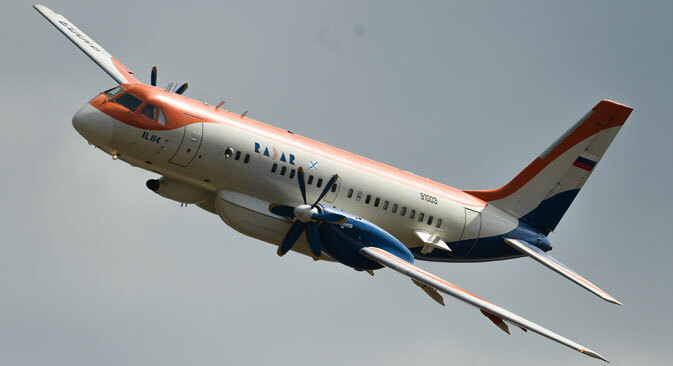 Until 2012 Ilyushin Il-114 planes had been produced at the Tashkent Aircraft Plant. In all, 17 planes were built, and seven of them are still in use by Uzbekistan Airways. About 320 Ilyushin Il-114 planes are expected to be sold in the period from 2019 to 2030. Peak output of 24 planes per year may be reached in 2025. The delivery of the prototype is due in 2018-2019, and 24 planes of the kind will be supplied to customers by 2025 (an approximate unit cost is 960 million rubles including VAT in 2014 prices). The Ilyushin Il-114 can take aboard up to 64 passengers. It is propelled by two TV7-117S (SM) engines, each with 2,500 horsepower. The maximal takeoff weight is 23.5 tonnes, and the maximum commercial payload is 6,500 kilograms (the commercial payload is 1,500 kilograms tops with a full fuel tank). Its cruising speed is 500 kilometers per hour, its maximum flight altitude is 7,600 meters, and its flight range is 1,000 kilometers with 64 passengers onboard and 4,800 kilometers with a 1,500-kilogram payload.